The LANCHECK consists of two modular units, a tester and a remote terminator. The modular design enables the tester to be used for local loop-back testing of patch cable or remote testing of pre-installed premise wiring. The LANCHECK makes it easy to recognize opens and shorts within a cable as well as identify reversed and miswired cables. It can verify a cable up to 2,000 feet in length. Furthermore, it comes with shielded connectors, which enables the testing of shielded twisted pair (STP) cables. It also features convenient Auto Scanning and precision Manual Scanning modes. The LANCHECK also generates a low emission frequency〝tone〞. Each individual pin/wire can be ed to carry a tone that can be detected with the Net Probe (PR-06P) or any tone probe, making locating cables easy. 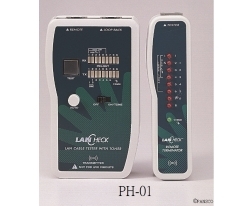 The LANCHECK comes complete with adapters for testing 10 BASE-T, EIA/TIA 568 A/B, AT&T 258A, 100BASE-TX, TOKEN-RING, TP-PMD, ISDN, USOC and BNC networks. 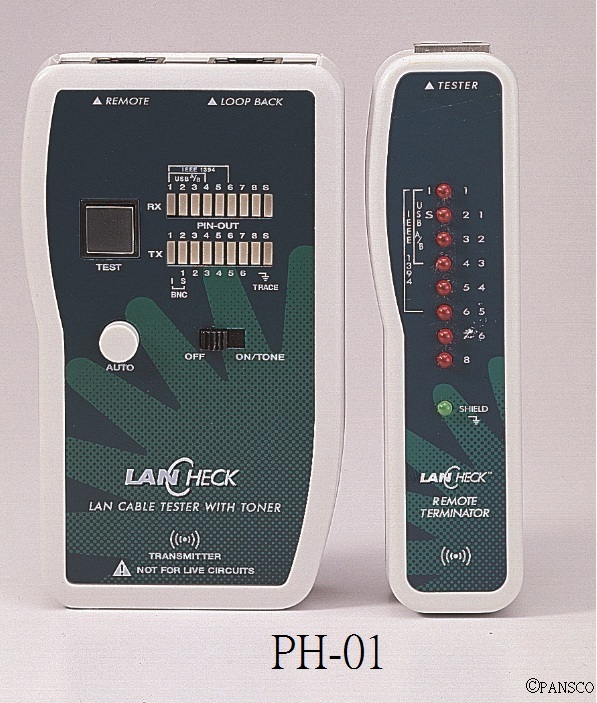 Other adapters such as RJ45-USB, RJ45-IEEE1394 and F-BNC can also be added to expand the LANCHECK functionality. A RJ-45-to-RJ45 patch cord is also included for testing patch panels and RJ45 network wall plates. It scans for continuity, opens, and shorts as well as reversals and crossed wiring. It features Auto or Manual scans for displaying pin configuration. It generates a low emission〝tone〞for cable tracing & identification. The remote terminator can be used to test existing cable installations. Patch panel and wall plates can be easily tested with the included RJ45 adapter patch cable. RJ45 to BNC adapters allow for testing & tracing of BNC cables.